Whispers in the Loggia: Tonight in Gotham: American Catholicism's "Power Hour"
Tonight in Gotham: American Catholicism's "Power Hour"
(Thursday 18 October – 5.50am) Even for this morning's expected spotlight on Indy, lest anybody forgot, today's Main Event – and not just in Churchworld – takes place back East. Of course, that refers to tonight's 67th annual Al Smith Dinner in New York, to be headlined again by both nominees for the Presidency in their sole joint appearance of the campaign beyond the debates. 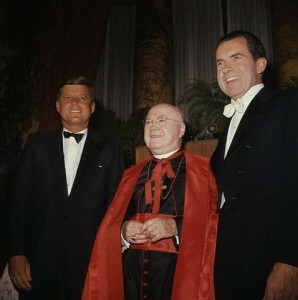 The custom dating to 1960 (right), tonight's Smith Dinner marks the first presidential-year turn at the tradition by Cardinal Timothy Dolan, who was named to Gotham three months after the 2008 election. Per the protocols for the evening, President Obama and Mitt Romney will flank the USCCB president at the center of the multi-tiered dais in the grand ballroom of the Waldorf-Astoria Hotel in Midtown, a block down 50th Street from the Madison Avenue residence of the city's archbishops. With the White House contenders sharing the keynote honors – and the cardinal-host leading off at the mic – the roast-style speeches at the annual fundraiser for New York's Catholic Charities are scheduled to begin around 9pm Eastern. Per usual, C-Span will be broadcasting and streaming the event live.